Rada report that they have arrested two suspects implicated in Sunday’s shooting of former Tripoli Security Directorate chief Salah Smuey (Photo: Screenshot from RADA). 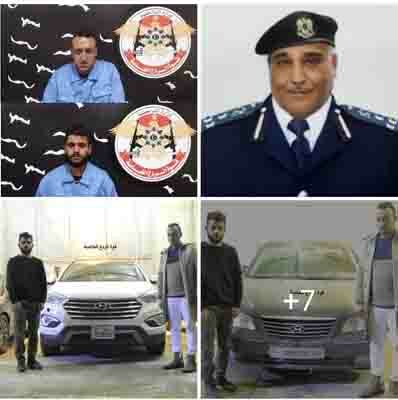 Two suspects in the Sunday shooting of Salah Smuey, the former chief of Tripoli Security Directorate, were arrested by the Rada Special Deterrence Force yesterday. Rada reported that according to preliminary evidence, the two suspects confessed to having committed the crime, initially thought to be criminally motivated, Rada said. Smuey’s vehicle was initially identified and targeted after the perpetrators had been parked in the courtyard of Ibn Taher mosque in the Al-Hadaba area of Tripoli. Rada said that the information gathered on the suspects was then presented orally to the (Presidency Council’s) Minister of the Interior (Fathi Bashagha) who issued instructions to Rada to follow up on the case until the perpetrators were arrested. The information, Rada revealed, was also presented to the Chief of the Investigations Section of the Office of the Attorney General, who issued an arrest warrant and ordered that the suspects be referred to the prosecutor. Rada also called upon citizens who had been robbed near the location of the Smuey incident at the time when the former security chief was assaulted to contact them. The arrest by Rada is yet another feather in the cap of the Presidency Council / Government of National Accord (PC/GNA) – aligned militia. It comes at a time when the internationally recognized Faiez Serraj-led PC/GNA in Tripoli is attempting to enforce so-called “new Security Arrangements” whereby regular police and army forces take more control in the capital. Serraj and his newly appointed Interior Minister, Fathi Bashagha, will have to deal with Tripoli’s entrenched militias, including the Salafi/Madkhali-leaning Rada Special Deterrence Force led by Abdelrauf Kara. This will not be easy. Love them or hate them, Rada have proved themselves quite effective at fighting crime, terrorism, illegal alcohol production and trade etc. This relative effectiveness comes when other state security entities are struggling to gain traction and play their role at a time when Libya is suffering from an effectiveness and security vacuum. Moreover, as evidenced by this information release about the Smuey shooting suspects, Rada have a very effective media and PR department. They waste no time in publicizing their activities and successes with slick productions and videos. They are quick to publish names, photos and videos of suspects and arrestees. This contrasts with the slower and less effective official, regular state police departments.